Kevin "K-Rob" Robinson turns it around at the BMX Bike Show at Darien Library on Saturday, Aug. 19, 2017, in Darien, Conn.
DARIEN — Already a proven gold-medal winner in the X Games as a BMX bike legend, Kevin “K-Rob” Robinson also demonstrated his ability to teach important values to kids. 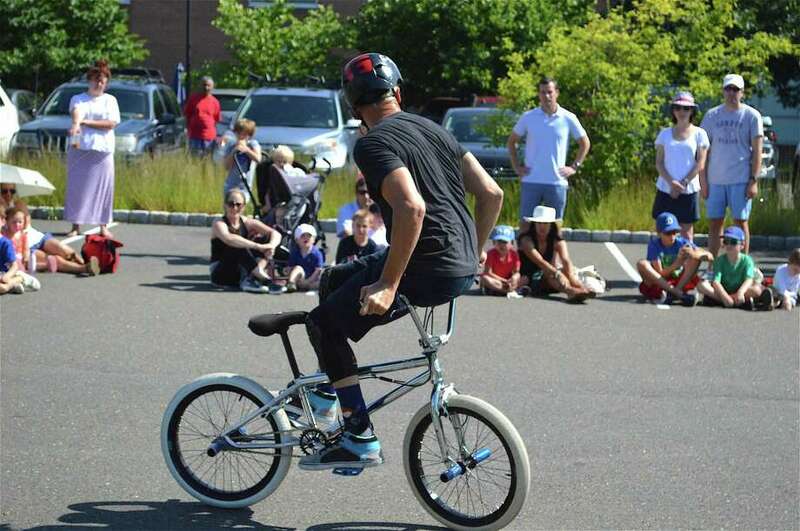 K-Rob, a two-time Guinness Book of World Record holder for bike stunts, came to Darien Library Saturday morning, where a crowd of around 75 watched his amazing feats on two—and sometimes just one—wheel, at the same time learning his thoughts about teamwork, bullying, and respecting others. “It’s an education program, (but) it’s delivering the education message in a fun way,” he said.